Most consumers won’t do a thorough evaluation of every aspect of their multifunction inkjet printer (MFP). If the darn thing prints reliably, makes a decent scan, and copies documents without too much fuss, people will be more concerned about the eventual cost of replacement ink than the details of software and hardware associated with a modern sophisticated device. 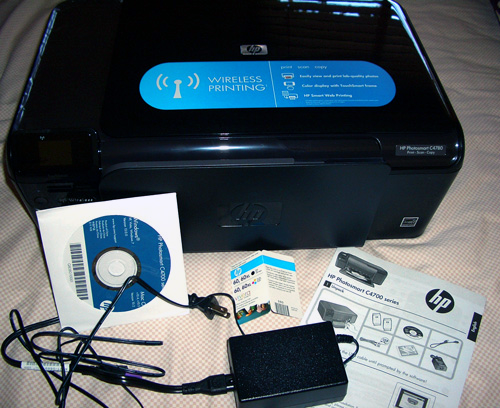 HP developed this printer for home users to accomplish everyday printing needs. For less than a hundred dollars U.S., you can purchase this sleek, black MFP from HP that prints beautifully, scans efficiently, and copies with enhanced options available. This unit is similar or identical to the “free” printers offered to Apple store customers who purchase a new computer. 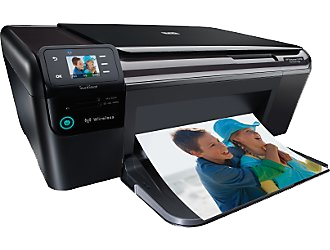 The Photosmart C4780 is one of the latest in a long family tree of multifunction HP machines dating back many years, beginning with the 1200 series, I believe. Recent developments include built-in camera card readers, wireless connectivity, and advanced scanning and photo editing software, plus less expensive and more efficient inkjet cartridges. HP put its shoulder to the Macintosh wheel of evolution about five years ago, and the company’s drivers and OS X compatibility are reaching toward a new plateau of (almost) stress-free operation. What you get with a C4780 that you don’t have with earlier units is good to very good wireless setup and printing — forty minutes from unpacking the carton to making your first wireless or wired print in OS 10.5 Leopard or 10.6 Snow Leopard. Prints from computer documents are the quietest and fastest I’ve seen for typical consumer pages or photos. HP claims that its C4780 can print 29 pages per minute (ppm) in black, and 23 ppm color, which is certainly faster than we’ve ever experienced testing and using previous home inkjet printers. I’ll get a stack of paper and a couple of new cartridges, and test those numbers. Here goes — be right back. I printed thirty pages from HP’s PDF manual, at Normal quality in Grayscale, on plain paper. Not including the forty seconds required for me to observe wireless printing was stalled, then turn AirPort off and on, and have the document sent to the printer prior to the first page being printed, the elapsed time was just under four minutes, and some of the pages were intentionally blank. Hmmm. Let’s agree this C4780 is fast, but not quite as fast as advertised, although PDF first page printing is often slower than ordinary documents. No home user will complain about seven or eight pages printed per minute. The quality of text and photos has been consistently excellent, as expected from the latest generations of HP models. HP’s updated scanning application is slightly different from what we’ve been using previously. Newcomers to it will be baffled initially, but soon will understand the interface and process. I have not been able to import photos wirelessly from a camera card to iPhoto, but wired USB importing works fine directly into iPhoto, which MyMac continues to recommend. Think of this MFP as an enormous SD/XD/MMC/MemoryStick/Duo card reader. (There is no CF card slot.) Wonder of wonders: a USB cable is included! “Scan to PC” from the touch panel is Windows only, but don’t lose any sleep about being a second class citizen, because we have the iLife suite, and they don’t. Photocopying controls are done on a tiny touch screen that seems unnecessarily miniscule until you are able to poke it accurately by day three or four. My wife prefers the simple single-button copy controls on her ancient unit from five years ago. I see her point, but it’s nice to have additional copying options available. Our HP representative reminds MyMac, “What’s great about the Touchsmart Frame is you can do all of the following things from this screen: select number of copies, fit images to the size of your paper, and produce borderless photos up to 8.5×11 inch.” That is correct, and it will take you several attempts to become proficient. This consumer C4780 is actually an advanced, multifunction marvel with intrinsic worth much greater than its purchase price. HP hopes you use it for years, buying copious quantities of inkjet cartridges during its tenure (and that is not necessarily a bad thing). I typically send prints wirelessly to it from about ten feet away, and often the first page emerges before I can reach the printer. I’m using draft mode much of the time, and its print quality is fine and dandy for non-critical text documents. It’s easy to become hooked on wireless printing. Make sure C4780 is a little closer to your wireless router than is your computer, if you use your Mac at the far end of the wifi range. Typically it’s necessary to turn off and on the AirPort in a Mac’s Menu Bar, if a print job appears to be stalled. You’ll see what I mean when you are in a hurry or past deadline. This inconvenience can also happen with other wireless printers under similar circumstances. Photosmart C4670 is very energy efficient, turning itself off and on better than other MFPs we’ve reviewed. I simply leave it plugged in and powered on all the time, and I let it determine when to take a little nap or a long snooze. So far so good on that score, a month into the evaluation process. The included printed instructions are basic to the extreme. You may have to snoop around the HP site and/or your applications’ Help menu to locate all the instructions, but be prepared to use them once you find them. Let me know if you need assistance in this area. The official manual is a 120 page PDF document (see first link below). A Snow Leopard OS 10.6 bonus is that print and scan features are built directly into the operating system. I just scanned a document in Snow Leopard wirelessly on the C4780 in the Preview application. Our recommendation is you download and install HP’s 10.6 software and run the HP Setup Assistant for most effective wireless printing installation, but nothing special is required to get 10.6’s scanning up and running. See the third web link below for additional SnoLeo instructions. MyMac recommends this versatile, low-priced, multifunction wireless printer. Here’s the separate URL that describes using an HP all-in-one with Snow Leopard and the built in Apple software. Win a FREE Hard Drive on Twitter! – Update!